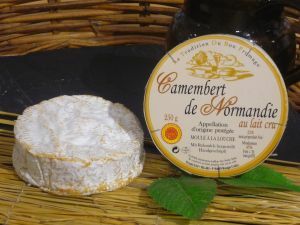 Camembert is a soft, creamy, surface-ripened cow's milk cheese. It was first made in the late 18th century at Camembert, Normandy in northern France. The cheese is made by inoculating warmed milk with mesophilic bacteria, then adding rennet and allowing the mixture to coagulate. The curd is then cut into roughly 1 cm cubes, salted, and transferred to low cylindrical camembert molds. The molds are turned every six to twelve hours to allow the whey to drain evenly from the cut curds; after 48 hours, each mold contains a flat, cylindrical, solid cheese mass weighing approximately 350 grams . At this point the fresh cheese is hard, crumbly, and bland. The surface of each cheese is then sprayed with an aqueous suspension of the mold Penicillium camemberti and the cheeses are left to ripen for a legally-required minimum of three weeks. This affinage produces the distinctive bloomy, edible rind and creamy interior texture characteristic of the cheese. Once the cheeses are sufficiently ripe, they are wrapped in paper and may be placed in wooden boxes for transport.